Roger Bruhn’s exhibit, "Do[n't] Look Twice," which was displayed in February at Lux Center for the Arts, focused on his photographs of reflections in shop windows. With so many different, significant details to notice, the images often appear as if they are layered collages. Roger Bruhn's new exhibit, which ran at the Lux Center for the Arts in February, featured, among its 25 photographs, a picture of a mannequin looking out on a busy street. 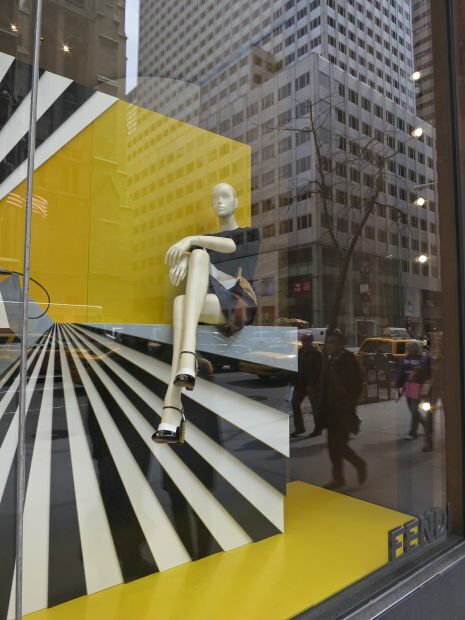 Taken in midtown Manhattan, the female mannequin sits with her legs crossed, appearing to regally gaze on the drab office building to the passing taxicabs and the pedestrians. At least three worlds are pictured here: the stylish ideal world the mannequin attempts to project, the world of the actual store window, and the reflected real world, viewing the other two. If you look closely, behind the mannequin, you can see the shadowy figure of a couple standing and looking at the store window. This – like all the photos in the exhibit – is at least worth a thousand words. The exhibit, "Do[n't] Look Twice," focused on Bruhn's photographs of reflections in shop windows. With so many different, significant details to notice, the images often appear as if they are layered collages. For the series, Bruhn had to venture to bigger metropolises; such city store windows are not as common in communities like Lincoln. Most of the pictures are from New York City, the bulk having been taken in the last few years, although some date back to 2005 and 2006. While Bruhn has been a longtime photographer, working in all sorts of forms with all different kinds of subjects, this, he said, is "what I keep coming back to." The window series grew out of similar work Bruhn did – also highlighting advertising – centering on billboards. To get one of these shots, Bruhn said, you have to be patient. These photographs highlight so many contrasts, but most notably the contrast between the world as it is marketed and the world as it is. Susan Sontag, in her famous essay "On Photography," described the photographer as a "voyeuristic stroller who discovers the city as a landscape of voluptuous extremes." Layer by layer, during his wanderings around the city, Bruhn seems to be assembling all of the extremes. Most often, he doesn't know what extremes – or what of anything – may end up in the frame. “You just can’t predict this stuff," he said. "You can’t see all these things at once.” The real revelation occurs once Bruhn pages through the photos in his computer at home. Two particular photographs in this exhibit, perhaps, exemplify unpredictability more than the others. 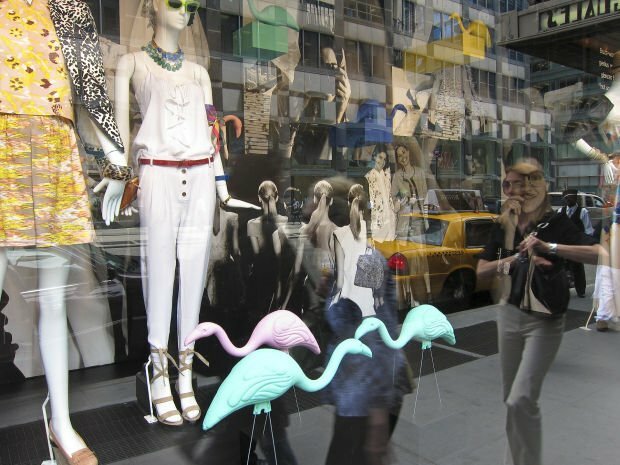 In one, a store window features two female mannequins set around some pastel plastic flamingos. Photos of women in the background of the store window – or are they across the street? – seem to be somehow looking out over the intersection, even though they are facing toward the store. A picture of a man taking a picture seems to be taking a picture of us. People and images inside and outside are indistinguishable. It's both unsettling and very difficult to take one's eyes away. The other is a photo of photos, polaroid-like prints, hung perhaps on a clothesline. Some sort of mirrored sculpture at the bottom of the window display is showing us the same image we see – yet another reflection – but rendered in different light from different angles. There are definitely too many details to take in at one time. Surprisingly, Bruhn said he used a simple Canon point-and-shoot camera to take the "Do[n't] Look Back" shots. There is method to this apparent professional photographic madness: It helps him stay anonymous, which is an essential part of this entire series. That, perhaps, enabled him to get one of my favorite shots of the exhibit. In it, two store mannequins' reflections make them appear to stand, ramrod straight, on the outside sidewalk. In the background, trudging up the street, is an elderly stooped-over man with a cane, carrying some kind of case. Bus and cab traffic is heavy behind, and the tall 30 Rockefeller Plaza fills up the rest of the frame. Here, maybe more than any photograph in the exhibit, is the contrast most notable – not just between advertising and the real world, but between ideals and reality. This series is indeed about the differences between the real and the unreal, the representation and the actuality, which we confront every day. If the easy commercial images we are bombarded with, to quote Sontag again, are "the most irresistible form of mental pollution," then Bruhn's photos help us clean the air.